Next Project | Mac Wants The What? In the last week I have been adding new graphics to the game, little extra touches like a pool table, new corpses and little extra bits like that. Jose has been busy handing work into me and we are close to the end now. We even put some time into a secret mini-game in the game which I’m sure you’ll find fun. As promised I did make a video although It took me a few attempts as I didn’t really know what to show off, I didn’t want to spoil too much and I’ve already talked about v2 features as it is. Below is the video tease for Prequel Mode, View it on YouTube and read the description to find the voice actors credited. I’ll post a recap of the v2 features as we get closer to the end. As for release November looks unlikely but I’m trying to get stuff done. My main concerns are with work contributed by others but sometimes people are busy I get that. I’ll keep you posted but I hope you don’t mind a December release, I want to release the v2 update/expansion as intended not half-done. Voice Acting; when a developer is lazy and skips voice acting in favour of text there is good reason. It requires a whole extra scope of balancing, quality control and management that is purely cosmetic and while enhances the experience logically doesn’t add anything gameplay wise. There is 1 character left to record and 6 left to edit & get retakes. I started VA casting in August but wish I had started sooner as it has taken more time than expected. It’s not fair on the other voice actors if I release v2’s Prequel Mode half-voiced. Macready’s Story; There are 3 parts to making this, the first (in progress, nearly done) is the sprite tiles and graphics. Jose has created most of what I need now and once that is all setup we can move to part 2. Part 2 involves me putting the content in game. The plan is that you find Macready in Story Mode and he tells you about US Outpost #31 THEN he tells you about what happened after. I’ve got it planned so you take control of Macready and experience a choose your own adventure short story as told through his eyes. The multi choice elements will affect the outcome of his story and what happens afterwards. In the transition back to Story Mode he will set you a few tasks (general rpg quest stuff) and you will help him resolve any unfinished business at US Outpost #31. Finally Part 3 is the “Art Assets” or Artistic Cut-scenes that are used to display parts of the story that are too difficult to sprite or more impressive in art format. Theres around 30 of these and they will take Jose some time to finish so during Part 2 I can leave “placeholders” where the art will go making it easy to drop them in once completed. As a side note the game is a lot more difficult now, general life expectancy of the average NPC has fallen significantly. Captain! October was a slow month and we’re a little behind but a good portion of work was turned in at the last minute so let’s hope we can make that release deadline! Major Bugfix (I hope). I’ve removed a script that allows enemy summoning/spawning and replaced it with a less fancy but still effective approach. I believed that this script was responsible for not only enemy battle graphics remaining in battle when dead but was the cause of one significant and annoying game crash where RPG Maker would just, well… crash. It’s only happened to me a handful of times (for some reason especially at the medi-center in original mode) but it was annoying. Hopefully this fatal flaw is now resolved. I think the issue was the game didn’t know how to dispose of the spawned units and there was likely conflict with other scripts. The game audio has been lowered for the most part across the whole game. This decision was made because the voice acting was hard to hear. I think I have struck a better balance now. General changes and fixes have been made to the game and I am mostly personally responsible for testing game modes to make sure they work now. Finally Jose has redone ALL the existing backgrounds in the game in a more updated style. Voice Acting. I have good news and bad news. 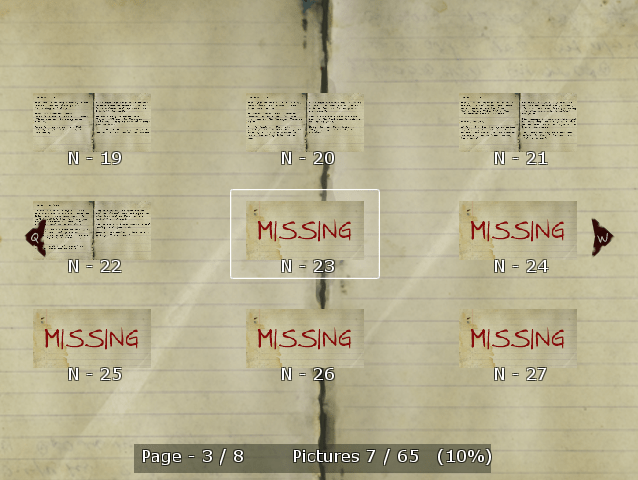 Good news I have edited over 600 files which are now placed in the game. I worked with amateurs and professionals so the quality is a bit mixed but I hope you all appreciate the effort and added immersion it brings. More good news is that 1 more character is near completion 2 just need some retakes and 5 have just been handed in to me which I need to edit for game use. The Bad news is that there is still 1 character left to do, one of the important story characters but I have someone trying to resolve that for me so I’m hoping that this doesn’t cause any delays and it can be complete this month. MacReady’s Story. We have just started on sprite work for this, once that is done I will move away from testing and work directly on this. I will finish this in November BUT there are 30 art images that the story requires which is quite heavy work to get done in the month so I’m going to see what sort of timescale Jose needs for this. I’m hoping it can be done this month but I feel these images make MacReady’s mutli-choice story more immersive and personal as he’s a core character to the film. Generally all I have to do is test things and fix things mostly. Survival Mode is being testing right now but Prequel Mode (voice acting/audio balancing test) and MacReady’s addition to Story Mode need testing when work outside my control is complete. I fall into the category of a fan based game which Steam doesn’t really accept. I think largely it would be due to the grounds of “copyright”. The main issues I can see would be the games name and names of characters potentially. In the v2 a lot of the movie and 2002 game audio has been removed and replaced so that is no longer an issue but in short it’s safe to say I wouldn’t be accepted onto steam as it would likely bring me unwanted complications. I still want to say this month, November 2015. I will do my best to give weekly updates from this point as we move closer but 2 things hang in the balance of affecting the release. One is the last voice actor (sounds like an indie movie) and the other is the big old 30 art images I need after Mac’s sprites are done. At worst you can expect December as I really don’t want this to go into 2016. I’ll do the best I can to smooth things along and I’ll play every card I have left to try and get this November release going. I should have a video for you in next weeks post of prequel mode in action. I really hope it’s worth the wait. Greetings Captain! It’s now October so here’s the update on the status of the v2 update of the game. It’s early in the month so I’m having to anticipate the timing of a few things..
I’ve tweaked a lot of stuff in the game, there is a lot of balancing that needs perfecting but as of now it’s a lot better in comparison to the v1 game. The game is still being tested by certain individuals and I am working on the various feedback I get where possible, the latest build released privately was the v2.2 which included the addition of the special enemy variants and a lot of the features I mentioned in the September Update. Facility Survival (Survival Mode) is also now complete. 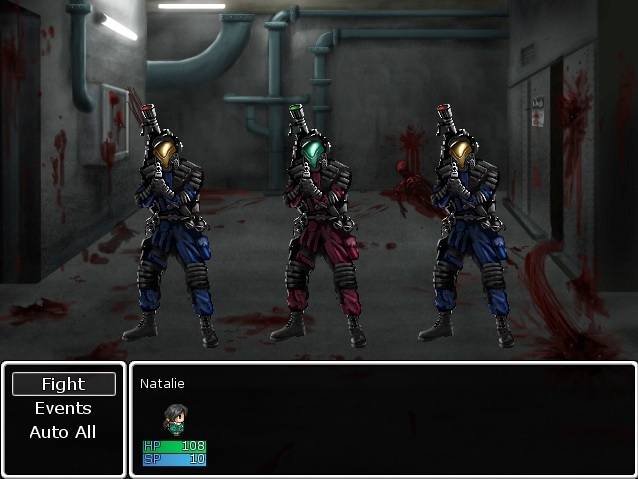 It’s a 25 floor simulation that focuses purely on the combat side of the game. It took me a lot of effort to beat it, it’s not easy. Originally you could only save every 5 floors but I now have the option to save at the end of each floor to help counter the sometimes random punishment the game deals out. This has been the BULK of my workload last month. It took longer than expected but I enjoy the new survival mode compared to the old one. It also features a level based on US Outpost #31 with all 12 characters from the movie lovingly redesigned by Jose. Enemy Art/Battle Graphics are all complete thanks to Jose and we have moved on to designing new battle background art assets for the ship story. His style is different to Shinn’s and I’ve had more budget to use this time around for more “realistic” backgrounds. 4 New Title Screens have been created for the game. In terms of Voice Acting I’m still trying to fill 2 more roles and am awaiting work to be sent in for 12 characters. It’s dragging out a lot and I hoped it would of been done by now, I dislike micromanaging and chasing people up but I’ll keep on it. Due to time constrictions I have decided not to pursue voice acting for MacReady’s style but will retain the art direction I wanted. For Artwork Jose is currently creating backgrounds for me, after this I am going to get him to fix and update some of the game sprites (I’ve added new characters/changes since he last did it) and then he needs to create sprites, graphics and artwork for Mac’s story as well as voice one of the characters for me. Jose’s more realistic background style/approach for Prequel Mode. On a side note there’s a lot of RPG Maker Games featuring on steam lately (most are very expensive) but I was wondering how much interest there would be if this game was released on steam (It would still be FREE) or do people just prefer to get it via ModDB and mediafire? New Enemies The Pilot and the Spitter. The Pilot is a creature cut from the 2011 Thing Movie (Thanks Sadonrii) and the Spitter is just something that me and Jose made to be annoying and bombard you with well, spit. The Ship Story (Prequel Mode) is now complete. Cody Ball helped me write this little short that turned into a much bigger story. Set aboard a ship you play as a researcher and when someThing found in the ice is brought aboard and thaws out bad things happen. Set before Original mode and ties into Story Mode. Features timed elements and a lot of artistic scenes and even my own home made audio. Blake’s Notebook. This feature is available in story mode, Blake will give you his notebook full of information about events that have unfolded. However you can collect research notes in the game to unlock concept art with little supportive text and descriptions about each creature Jose helped me make for the game. Quintel’s Update. In the summer of 2014 I created a community for Story Mode that you can help and features as a hub for many game side quests and additional content. I have expanded on this story further to give it an alternate ending scenario and features more locations for the game. Tape Saving. The game now has a difficulty option of having to use “Cassette Tapes” to save the game. No more save scum. US Captain improved. The US Captain now has a lot of new skills to buff his allies and can call for reinforcements making him more of a mini-boss fight than just there to shoot at you. Enemy Perks/Going into cover. When the first turn of combat is engaged the enemy (Military) will “spot” the player and some of them may gain the cover status (increasing their defense). Other enemies will also reveal little icons by their names which will indicate various traits or perks they have. an example of this is a little red skull with a cross-hair which indicates that enemy has a +15% CRI chance and might be more dangerous than his generic allies. 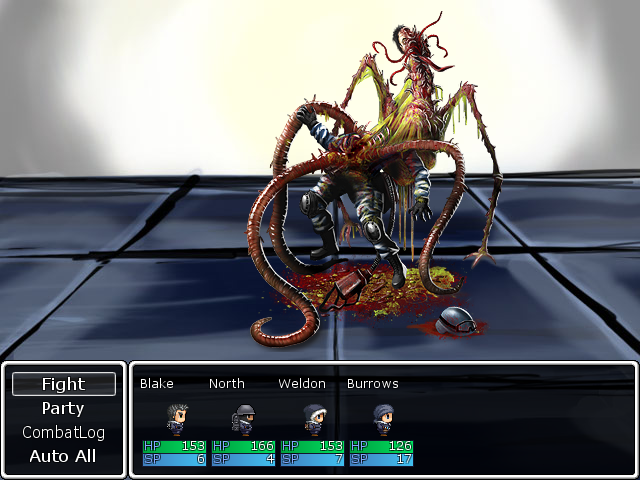 This varies enemies a little and makes combat more challenging and varied. Above, The Pilot (Middle) and The ‘Spitter’ enemy type. I am replacing some of the existing audio. I am going to remove spoony’s voice as well as any audio from the 1982 movie and the majority of audio from the 2002 video game (such as Blake’s actual voice). I will re-record what I can with voice actors but I feel that it is best to have as much original content in the game as possible. 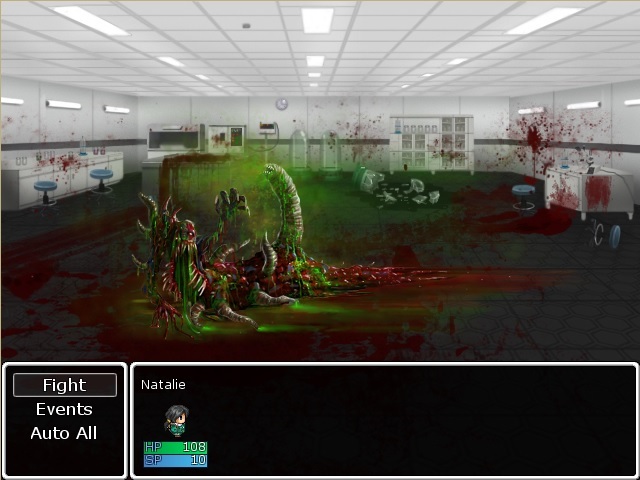 On the subject of recording, work has begun with Voice Acting for Prequel Mode and its going well. However I still need more help with this so if you are interested in VA work (paid) you can audition here. I am also updating the in game mods/attachments again with the help of Blak Dragon to include more variety and I may include a second accessory slot as he mentioned it doesn’t make sense to wear a backpack but not glasses. It’s more an issue of balancing the game and having effective choices with impact. Mercenary Update: For Story Mode I am including a small Mercenary outpost with a variety of tasks and trading opportunities. Like Quintel’s community it is all optional content and a brief distraction from the story. Ship Artwork is nearly done and going well, got a lot of lovely artwork to help depict some of the scenes thanks to Jose. With the improved game performance and the redundancy of the “Lite Build”. Blak Dragon has offered to test the games enhanced lighting. Will keep you posted on how this turns out. Gen Inc Titan: This may seem a little ridiculous but we are adding a secret mechanical cybersuit into the game as a gen inc project that you have to fight. It’s a throwback to 80’s films like Terminator and Short Circuit and nothing to do with me playing a lot of Xcom, not at all. Finally I am going to replace the games survival mode (although the old one can still be accessed from the test map). The new mode will let you play as Gen Inc and you will be given ‘missions’ by the Gen Inc board. It will revolve around building up a squad and small base management features, again totally not xcom. Above, Blake’s Notebook: A collection of notes and concept arts. The UI was designed by Christie Shinn and the script code itself is by Mog Hunter. A bit of bad news now I have to delay the release of the v2 update until October, maybe even November. So please bare with me while I try my best to get everything done in time and test what I can where I can. Finally a big thanks to everyone whos been involved with the project and thanks to all the help and support I have received. Game is harder, units have lower hp values and lower sp values (but sp costs have been reduced). 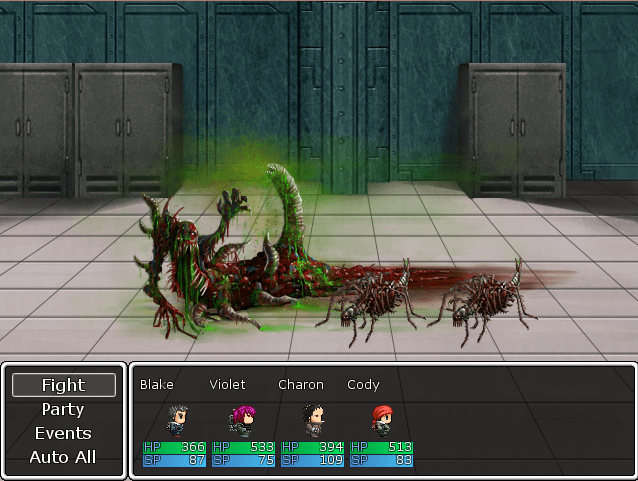 Infection chance increased by 1-2% depending on enemies, makes a significant difference in casualties. Starvation and Fever/Cold Exposure work in the game and offer additional challenge. Minor bug fixing and spelling corrections. 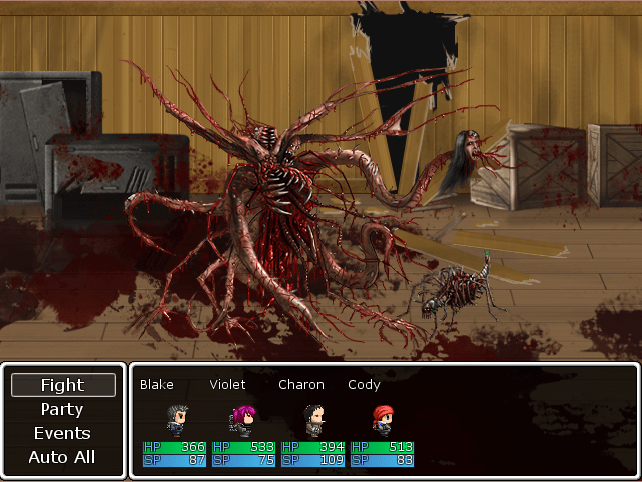 Additional artwork added to the game for side-bosses. Enemies are stronger and faster than before so AGI value plays more effect on your units. Altered SP regen and healing abilities to be more valuable to you. Medical items have been changed to reflect the new hp decrease and are more valuable to you. Solo thing enemies have additional attacks and provide more challange. Flares actually run out after 12 minutes or so. 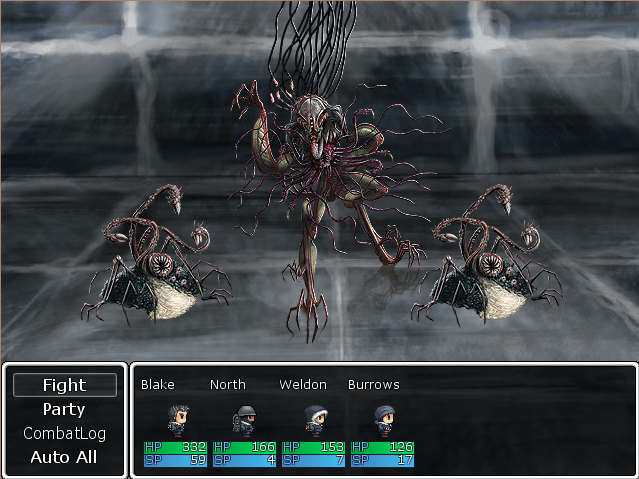 Starvation can occur every 6-10 minutes in the game to a random member (of the first 7) of your party. Scrapped plan for MacReady to have his own Extra Content story, want to include him in Story Mode “retelling” the events of what happened to him after Outpost #31 in a interactive comic book style way. Again optimistic that I have enough money for this and am indecisive about a full voice cast or just 1 voice as MacReady telling the story. Greetings everyone, its been some time so I’m going to summarize this as best as I can. 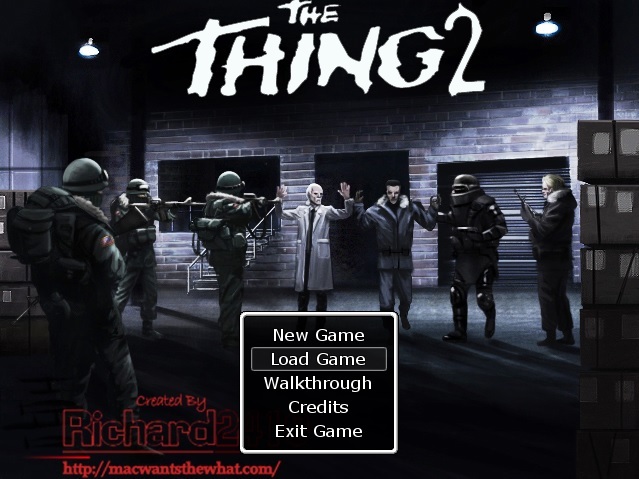 I released The Thing 2 RPG in November 2013 and in March 2014 I began working on an update for the game which would feature new content, additional game modes and other changes to the core game. I intended to complete this by late 2014 but unfortunately I had to shelve it as I started a second job, 24 hours a week (+8 unpaid) as a Manager in August 2014. In combination with my part-time job making pizzas (12 hours a week) I have been working 6, sometimes 7 days a week since August 2014. My current contract as a manager ends in April (I’m only temp cover) but its been a really valuable experience for me. Massive Weapon re-haul of damage calculations and completely redone weapon attachment system as equip-able MODS in the game. Updated Story Mode: There is now a community outpost which you can interact with throughout the course of the story. Pierce’s Side Story (Extra Content): A short story about Pierce, filling in some of the gaps in the story, similar to Avery’s story but features a stealth based mini game/puzzle scene. ‘Untitled’ Ship Story added to Extra Content: This is the fan fiction story I was submitted that I have invested a lot of time into. It’s about some researches on a ship that excavate a thing buried in the ice but the boat then gets trapped in the ice, thing thaws out, you know the rest. You will struggle for survival and I’m ambitiously hoping I can make the game play out like Dead Rising in that it will take place over a set period of “game” time to unfold events/characters and influence the outcome. While this story features in the extra content section, I will do my best to make it cannon to the main game stories. This is the first addition to Extra Content that will be more than just a short story. Tutorial Remake/Review: I will be redoing the game tutorial to make it more interesting and explain things better. I need to focus less on over explaining things and just going for the key aspects of the game. So I made a game, What happens now? Well other than trying to round up the funds to invest in a good computer (Not even at software yet, great!) I can’t say I’m exactly sure what I should be doing. As everyone knows “Underwear + ? = Profit” but what is “?”? I have given it some thought and my general plan of action is to team up with a friend and try and make something in Unity together (Baby Steps!) hopefully this “Something” will be fairly decent and sell-able (Apps, Steam etc). As for now I guess I just have to clear my head of anxiety and take actions for myself, I am in the process of thinking of ideas for a game as well as doing some side work (DLC) for my recent (only) release (Thing 2). If anyone stumbling across this happens to be in the games industry or has any helpful hints on how someone can get started on the right path I’d appreciate useful comments. Anyway asides from my deranged ramblings and general pessimism I thought I’d write a few things about the work and ideas I’ve come up with. I don’t really wanna say too much but I’ve sort of got this idea in my head that with my friend we will make a horror game. Lately I’ve been playing quite a few horror games and I find that for the most part the majority of them are not scary and too easy. I think its important for a game to keep tension throughout but I know this can be difficult especially with horror games being somewhat predictable, having “set events” and easy retries. Also I find that the survival aspect is watered down a lot too in these modern games. I’m not that old really (I’m not that young either) but I had a Play Station One as a child (PsX) and I remember how horrifying and scary games like Resident Evil, Silent Hill & Alone in the Dark actually were. While I’m sure there are older games on older platforms with probably the same effect those are the games I remember always being unable to play, even my older (late teens, early 20’s) relatives at the time struggled to get to the grips with the sheer horror. In the last 15 years with the advances in film and graphics those horror games have lost a lot of their original effect. I guess the ambition is to bring back that old school horror. (I admit the Silent Hill 2 HD Release was pretty scary, minus the bad voice acting and certain graphics) Its somewhat of a challenge but I’m willing to try and take a crack at it, keeping that tension is the key element without being cheap with over the top gore or jump scares. I’ve been mulling this over in my head for a while. Sometimes I question if it is worth it, I didn’t reach my personal ‘Download’ target and I never actually received that much feedback but I am glad for the somewhat 600+ people who downloaded and played it. Anyway I’m still in the prep stages but I have come up with a bunch of ideas for improvements to the game as well as additional content that explores other parts of the story. For starters the crafting system needs sorting out which is a messy, long and frustrating task (Puts me off a bit) as well as there needs to be some changes to the exp system and new features like enemies bursting out of crates. I did have a lot of fun coming up with Story DLC and Extra Content DLC however and I would like to list some of my ideas. Story Mode; “Mining Outpost”: I had this idea that there was this old outpost taken over by Gen Inc staff who had defected from the company. In this way they start their own settlement (as the Captain has the FieldBase). Over time various people and misfits would settle into this location and it would offer the player a “community” to interact with and support over the course of the story. It also shows that sense of not being able to survive alone. Extra Content; “Pierce’s Lost Story”: There are some parts of the story where Pierce goes off on his own and I have written quite a few plot elements that tie together nicely and also effect / crossover with other stories (so everything makes sense). Extra Content; “Thing Mode”: This would be the mode where you play as the thing entity and have to escape your containment. Once escaped you would be able to grow in mass/strength by assimilating others and be able to hide out among the humans. This story ties into the events of Avery’s, Pierce’s, Charlie Teams, Orton’s and Whitley’s Stories while aiming to create a different experience. Extra Content; “Alaska Based Story”: I’ve thought about maybe having a shipment or something arrive in Alaska which effects a remote community (of which you are either staying or live there). It would be like a short story based on the story that I read for the Redwood falls video game. I probably overkill it with the tie ins and miscellaneous references sometimes. Extra Content; “Who Goes There?”: I was thinking about a game where you are human and its sort of like murder mystery/broken sword type game where you have to play detective in order to find out who is human. This would involve you making (potentially wrong) decisions based on random evidence found in your search of the area. I was thinking about US Outpost #31 as a setting as I’m quite familiar with the character personalities. It would be interesting, probably not very action packed though. Cluedo on steroids. Even if I don’t follow up most of these ideas I had fun working on them at least. 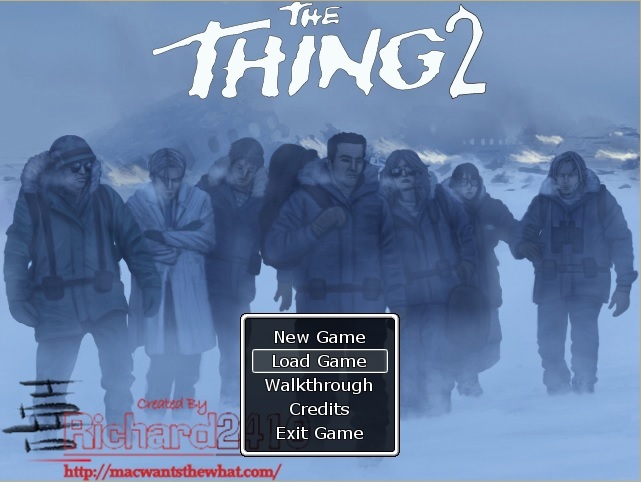 If there is much of a demand for certain additions / modes / functions in The Thing 2 RPG then I will be happy to oblige. Thanks for Reading, it was nice to express my ideas.